And, believe us, Hart and Wright are in the public eye, as much as scholars in these fields can ever expect to be. They come with attached fan clubs and retinues. While debating the quality and character of biblical translations might lead many public understanderers to turn their attention to other topics and events, we are in the company of those who believe that debates over biblical texts and their translations are fateful. In Christian orbits, debates over which translation one is allowed to favor have led to schisms and vicious conflicts. For one moderate example: not until after the Second Vatican Council were some Roman Catholics to favor and use the King James Version of 1611. Senior readers of Sightings will recall the bitter melees which followed the publication in 1946 of the Revised Standard Version of the Bible, popularly or unpopularly known as “Stalin’s Bible,” as designated by some Cold Warriors who suspected and charged Communist influences in the RSV. Why did “virgin” of The Virgin Birth in Isaiah 7:14 now appear as “young woman” or “maiden” in the new translations, et cetera? While we may not be proud of the way scholars and agitators on many sides of these translation conflicts have acted, I’d like to change emphasis quickly and argue that the intentions then and issues now between Wright and Hart are not trivial. 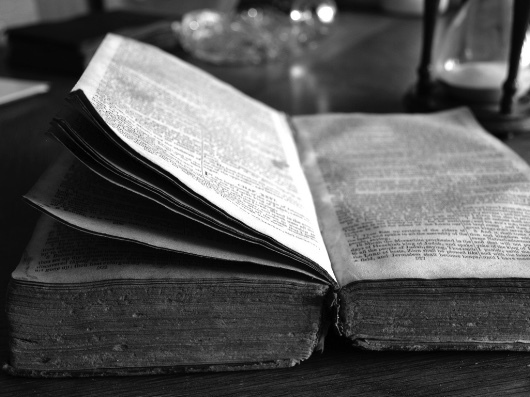 Biblical texts in translation turn up in international affairs, U.S. constitutional-legal traditions, poetry, political campaigns, and piety, and they are spiritually very important to millions of citizens. The introducers of the 1946 RSV, which people of my generation lugged around (along with, soon after, the “New Revised Standard Version,” the “Revised English Bible,” the “New American Bible,” and the [Catholic] “New Jerusalem Bible”), knew of their importance in scholarship, worship, and the living of lives. So we pay attention. - Hart, David Bentley. “A Reply to N. T. Wright.” Eclectic Orthodoxy. January 16, 2018. - Wright, N. T. “The New Testament in the strange words of David Bentley Hart.” The Christian Century. January 15, 2018. A six-day exploration of religious ideas, themes, and conflicts as depicted in films.